St Paul’s is not only an iconic part of the London skyline but also a symbol of the hope, resilience and strength of the city and nation it serves. Above all, St Paul’s Cathedral is a lasting monument to the glory of God. Among the events marked at St Paul’s are royal occasions. In 1897 Queen Victoria commemorated her Diamond Jubilee at the cathedral. Queen Elizabeth II has also celebrated her Silver, Golden and Diamond Jubilees at St Paul’s. Royal weddings too have been held at the cathedral, including HRH the Prince of Wales’ marriage to Lady Diana Spencer in 1981. Its rich and diverse history means there is lots for visitors to the cathedral to discover. 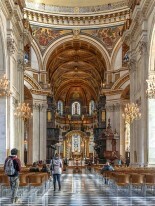 The current cathedral, the fifth to occupy this site, was designed by the court architect Sir Christopher Wren and built between 1675 and 1710 after its predecessor was destroyed in the Great Fire of London. The magnificent mosaics are the result of Queen Victoria’s mid-19th century complaint that the interior was “most dreary, dingy and undevotional”. The American Memorial Chapel stands behind the High Altar in an area that was bomb-damaged during the Second World War - a gesture of gratitude to the American dead of the Second World War from the people of Britain. An altar has now been installed on a dais in the heart of the Cathedral, bringing services closer to those who attend them. St Paul’s has undergone a historic ?40 million programme of cleaning and repair. This was the first time in its long history that the building had been comprehensively restored inside and out. This programme of cleaning and repair was finished in 2011 to coincide with the 300th anniversary of the completion of St Paul’s. The two million visitors and worshipers who come to St Paul’s each year are now able to witness Wren’s original vision and see his cathedral as fresh as the day it was completed. So come and discover St Paul’s for yourself. Explore the cathedral floor, then climb the 257 steps to test the acoustic quirks of the famous Whispering Gallery. Continue up to the Stone and Golden Galleries and enjoy breathtaking views across London, or take a moment for reflection and contemplation. Journey below the cathedral floor to the crypt where you can locate the tombs and memorials of world renowned historical figures including Lord Nelson, the Duke of Wellington and Sir Christopher Wren himself. Explore using provided multimedia guides (in nine languages), or join onto guided tours and welcome talks. The crypt is also home to ‘Oculus: An Eye into St Paul’s’, an award winning 270 degree film experience that brings 1400 years of history to life. The first project of its kind in a cathedral, ‘Oculus’ uses state-of-the-art projection technology to immerse visitors in the fascinating stories and history of this iconic landmark.